Izak Young remembers Leland Brown II as a friend who felt like an older brother. Young was devastated the day in May 2014 that Brown died of sudden cardiac arrest at age 15, while playing basketball at his St. Albans home with friends. Young, now a 14-year-old student at Charleston Catholic, wanted to find a way to honor his late friend’s memory. 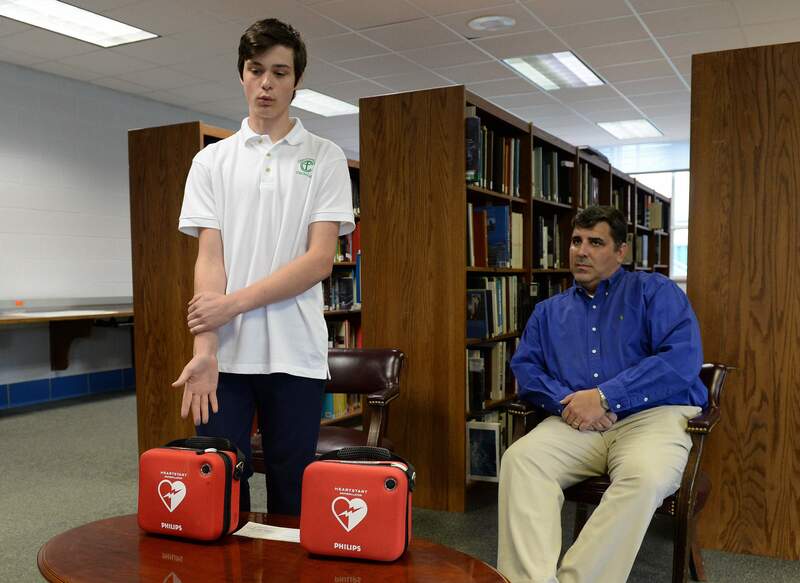 The Eagle Scout candidate did so Thursday morning by presenting Charleston Catholic’s athletic program with a pair of automated external defibrillators. Catholic’s sports teams can take those AEDs with them for road games, where the Irish often travel long distances to rural areas to compete. The process took more than five months, Young said, filling out paperwork to raise money through the Boy Scouts, then visiting 23 businesses around the Kanawha Valley soliciting donations. Young was able to raise $2,000 to not only buy the AEDs, but also start an account that pays for new pads and batteries. He also put together a training session for coaches and parents to learn how to care for someone going through sudden cardiac arrest. “I wanted to make sure, for him, that nothing like that would happen to anyone else,” Young said. Young, who is playing baseball for Catholic this season, is proud to be able to help his teammates and classmates. Charleston Catholic athletic director Lee Bradley said Young’s donation was a great benefit to the athletic program.